Good stuff as usual, Josh. Maybe it’s because of Cecil Cooper, Cecil Fielder, and Willie Upshaw, but I pictured Cecil Upshaw as a dark, burly 1B-DH type. He could be a Reggie Cleveland All-Star. Are the Reggie Cleveland all-stars strictly ivory guys with ebony names, or is it a mixed squad of the misleadingly monikered? I sort of hope it’s the former, and that they play periodically against a team captained by Troy O’Leary. Jesus Christ, this was good. I think that there are enough players for a split squad game between the Reggie Cleveland All-Stars and the Troy O’Leary All Stars. If he wasn’t a Boy Of Summer, Roy Campanella could catch for the TOAS. Mike Tyson, the mustachio 3rd baseman for the Cubs, could always man the hot corner for the Reggie Cleveland squad. 2. Holy crap! Any other Onion fans recognize who this is?? Herbert Kornfeld was a pitcher! “Has problems with left handed hitting. Wears Glasses. Throws Sidearm. Has some chance if he can learn”. Can he learn? I’m sure the moment he put on those glasses it certainly increased his chances. 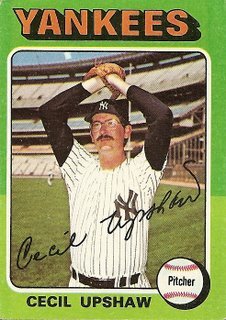 The second thought that went through my head after seeing this card was Cecil starring as the “I believe you have my stapler” guy from Office Space. The first thought, was of course, the Reggie Cleveland All-Stars thing.